The first snow of the winter fell a few days ago, and today it melts away. The sun has faded into the clouds, the colors have deadened, but there is a merriness to this retreat into the dark. I look forward to Thanksgiving. I will build a snow fort with my little brother at home. I think about how little I know. I know that cogito ergo sum, that I am not a brain in a vat, and that Isaac Asimov’s supercomputer did not write Genesis. I know that fall will bring winter will bring spring will bring summer. That much Michigan will give me. These spots of certainty are as stars against the winter night, proof that the world is still out there. I might rather gaze up into a starry, starry night than be blinded by the Sun. By the Sun I might see everything else, but what will become of those stars? There is a circularity to this universe, isn’t there? A body in space, when large enough, will condense into a sphere, because the optimal ratio of a sphere’s surface area to volume allows for the most rapid release of energy. Might not the universe, then, be a sphere? There is a black box, somewhere, that rejects the way of this sphere. It holds the answer, a yes or a no, to the one question I want to ask. I might not know the answer to anything, but I imagine that I could ask the question to everything. If you were given this black box, what would you ask? And would you open it? And I would never open the box. At the center of Mecca there is a black Cube. When Muslims pray, they face toward this Cube. 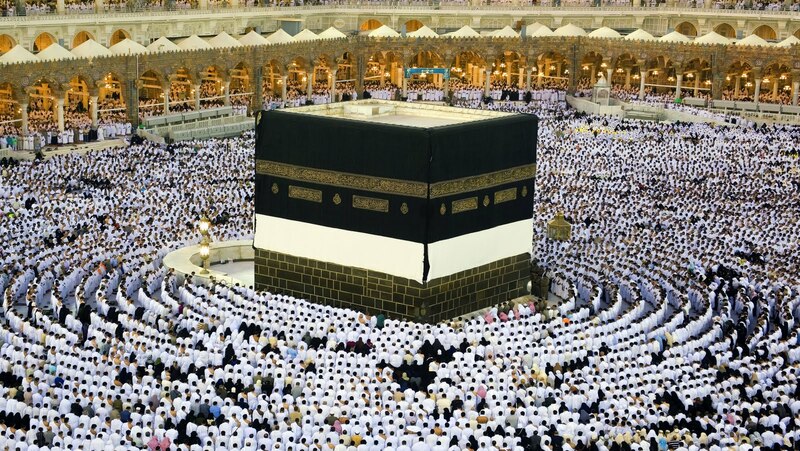 All Muslims are obligated to make pilgrimage to Mecca at least once in their lives to circumambulate this Cube. There is a never-ending current of pilgrims circling it, drawn as if by a gravity from the far reaches of the globe. A pilgrim will revolve about the Cube seven times as part of his pilgrimage. The revolution is said to be of the rites of Abraham, the Jewish patriarch that was nevertheless a folkloric figure for all of Arabia. More essentially, this revolution about the Cube symbolizes the gravity of God in the Muslim’s life. This Cube was built by Abraham and is the House of God on Earth. Above this Earthly House, beyond the Seventh Heaven, is the Heavenly House. The angels revolve around this Cube in the sky, and there are so many angels that even though seventy thousand strong circle it at once, once an angel has circled it he will never again be able to. I have circled the Cube in Mecca, prayed toward it for much of my life. I have kissed the Black Stone that was sent down from Heaven. There are some VIP’s who are invited to the inside of the Cube in Mecca. There is not much to behold. An empty room, mostly, cleansed of the idols that it once housed in the Days of Ignorance. It smells of musk. Once inside the Cube, one can pray in any direction. If I were ever invited inside the Cube, I would refuse. I am condemned to spend my life in revolution around this House, not knowing whether or not God lives inside. I will worship the question, because in that I might have a purpose. As I cross the threshold, I fear that the stars in the night sky might flicker and die. As I step inside, I fear that the world outside might cease to be, that I might never be again. Thank you for your readership. The place might be so foreign to us, but the question is universal. Thank you for voicing such an interesting perspective about a place and concept so foreign to many of us.